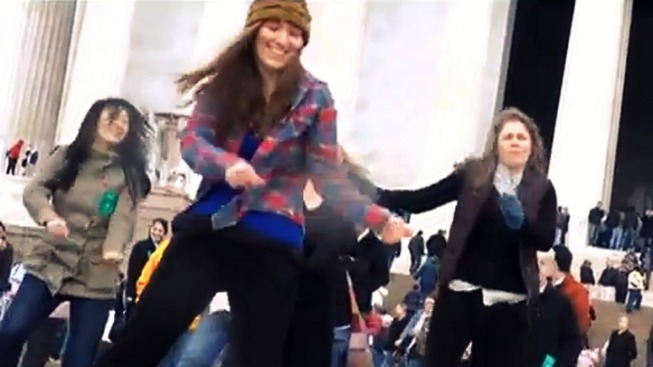 An impressively well-coordinated flashmob turned the foreground of the Lincoln Memorial into a performance venue in observance of Equal Pay Day. Grooving to a mashup of tunes including "She Works Hard for the Money," "Workin' Nine to Five" and "Miss Independent" on April 2, the crowd aimed to bring attention to the gender wage gap, which states that, on average, a woman makes 77 cents to every dollar a man earn performing the same job. Their YouTube video went live on Equal Pay Day, Tuesday, April 12. The crowd -- made up of students, working women, retirees and activists -- was coordinated by the Center for American Progress Action Fund and the American Association of University Women. Although flashmobs form for plenty of reasons (we've seen snowball fights, pillow fights and zombie walks), this group obviously invested plenty of time working on their dance moves. That's probably a good thing, because if you're trying to get across a message that's guaranteed to end up on YouTube, you probably don't want to look ridiculous. So why is Equal Pay Day on April 12? The date "symbolizes how far into 2011 women must work to earn what men earned in 2010," says Pay-Equity.org. In the Huffington Post on Tuesday, actress/activist Marlo Thomas wrote, "I still have my little green button from 1970 -- with '59¢' emblazoned on it -- tacked to my bulletin board.... Now we're at 77 cents. Forty years and 18 cents. A dozen eggs has gone up 10 times that amount." In Thomas' piece, she cited Judy Lichtman, a senior adviser at the National Partnership for Women and Families. Lichtman advises concerned citizens to contact their senators if they support the Paycheck Fairness Act, which was reintroduced this week by Sens. Barbara Mikulski and Rosa L. DeLauro. 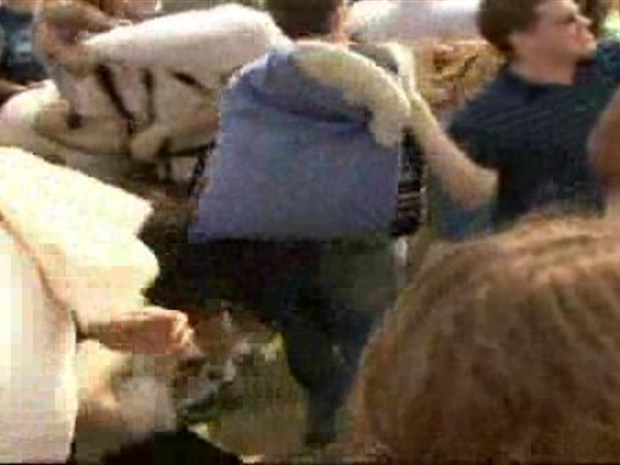 Thrown in among the tourists in downtown DC Saturday were about 600 people taking part in a flash mob pillow fight. So we're guessing that means no dancing to Kelly Clarkson songs outside the Capitol. Fine, senators, have it your way.